By the 17th century Chile had defined types of parade horses, pacers and trotters. 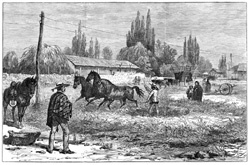 Chile progressively took over the reputation of Peru for having the best horses in South America and Chilean specimens were not only exported back to the headquarters of the vice-kingdom but also throughout the continent and occasionally, even into to royal courts of the "Old World". Although small numbers of parade horses had an extremely high demand and priest, ladies or handicapped persons could search out smooth gaited ambling horses by far the most numerous horse in Chile was the athletic trotter. This was the best horse for combat, for working cattle, for pulling carriages and wagons, for plowing and tilling gardens and for entertainment offered by informal sprint races. By the 18th century the yearly livestock roundups that were required by decree since 1557, took on massive dimensions. The pens that received the bovines herded down from the mountainous terrain needed to have a capacity of no less than 7,000 head. Sorting the cattle by ownership, designated use, and requirements for castration and branding resulted in herding and pushing cattle down long alleyways into classificatory pens. This gave rise to the aptitudes now used in the modern day Chilean Rodeo that are performed in a crescent-shaped arena known as a "medialuna" (half-moon arena). Chilean horses were selected for lateral dexterity, courage to confront and pin untamed cattle and an even temperament that permitted a high degree of trainability while conserving needed energy for a long days work. The escalating acreage in wheat during this era gave rise to select groups of mares that formed thrashing teams of between 50-100 animals. These mares performed a demanding task that required surefootedness and boundless energy. Any animal that stumbled or slipped to its knees was sent to slaughter. Within a circular confine, with wheat up to their knees, these mares were expected to move on their own accord. These were the dams of some of the best cowhorses of the time. By the late 1700's there were farms such as El Pricipal, Catemu, Quilimuta and Alhue that kept orderly records of the genealogy of the horses they were breeding.